Most recipes for fruit desserts are loaded with sugar and cornstarch, both of which are not so good for my babies. So looking for a way to make these jammy desserts without all the sugar put me in a jam.... I couldn't help myself. Until I discovered Chia Jam! The chia seeds basically helps to jell up the fruit juices without the need for sugar, cornstarch or pectin! Fantastic! This opened a whole new door for me. My son can have jam again! He has been off Jam, honey and syrup for about 9+ months. He misses it, and I miss being able to give it to him. What's a Peanut Butter sandwich with out the jelly? Or Pancakes without Syrup? We've managed but being able to cut the sugar and still make jam makes this a great alternative. For the Filling, I used frozen wild blueberries, but fresh would be even better! In a 2 qt baking dish, I mixed the blueberries together with 2 tablespoons of sugar,a squeeze of lemon juice and the chia seeds. I tried to leave the sugar out, but it was just wasn't the flavor I wanted. 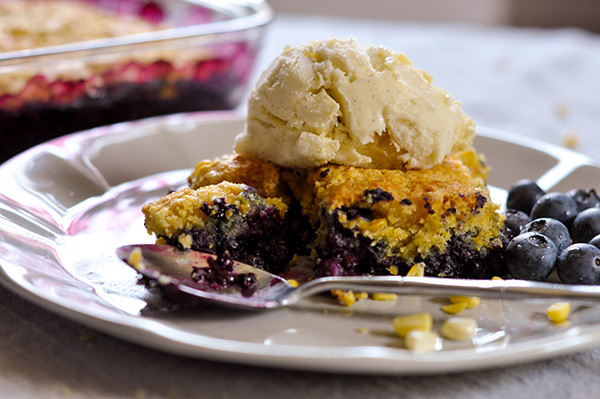 The mixture thickens up as it cooks, which makes this dessert easier than most other cobbler recipes, which require cooking the fruit first. My inspiration for the biscuit was a galette that Sally's bake blog had posted a couple of weeks ago. A Mixed Berry Galette with a buttermilk cornmeal crust. I thought that buttermilk and corn was a great flavor combo, so for the biscuit topping, I created a cornmeal drop biscuit with fresh corn mixed in. The fresh corn adds a great sweet crunch to the topping. In a large bowl, I mixed all the dry ingredients together then cut in the butter with a pastry blender. Once the mixture looked like pea sized crumbs, I gently mixed in the buttermilk and added the fresh cut corn. This is a wet batter, so all you have to do is spoon it on top of the blueberry chia mixture. I used an ice cream scoop to make it go by faster and also makes it look more even. Also I'm the worst at portioning! Pop that into the oven and thats it! This is perfect with a scoop of vanilla ice cream! Though, moments before I had a chance finish my shoot disaster struck, I left the cobbler out on the table to cool and went to put my daughter down for a nap. And...my dog had decided to sneak a taste.... and took a couple of chunks out of it. So.... This recipe is mommy, kid and puppy approved! Please enjoy before the dogs get a hold if it!!! In a 2 qt baking dish, mix together the blueberries, sugar, lemon juice, lemon zest, salt and chia seeds. Set aside. Add the butter and work it together with a pastry blender until the mixture looks like small peas. Mix in the buttermilk, then fold in the corn. Bake for 40 minutes, till the blueberry juices bubble and the topping is golden brown. Allow to cool for 15-30 minutes before serving!